Like Tim Thomas, a contemporary, Dwayne Roloson adapted to the game’s changes. At Thursday’s UMass-Lowell practice, the player with the best flow on the Tsongas Center ice was a 43-year-old alumnus. Dwayne Roloson, the stringy-haired goalie, was taking a spin in his new role among youngsters who weren’t born when he arrived in Lowell in 1990. The development of the school and the city is not unlike the transformation Roloson underwent to become a modern NHL goalie. Like Tim Thomas, a contemporary, Roloson adapted to the game’s changes. He evolved into a goalie who came up just short of backstopping the Lightning to a Stanley Cup Final appearance in 2010-11. Now, Roloson is transitioning again, although he trusts it is a temporary shift. Roloson is Lowell’s volunteer assistant coach. On Thursday, Roloson traveled from his home in Stillwater, Minn., to Lowell, where he will stay until Tuesday. For the duration of the NHL lockout, Roloson will join the team approximately once a month. He will work with the entire team, not just the goalies, assisting the River Hawks in whatever manner they wish. The plan was more than 20 years in the making. Shortly after touching down in Lowell in 1990, Roloson and classmate Norm Bazin became fast friends. As freshmen, they talked about how they might partner later in life, on or off the ice. Bazin, who is in his second year as UMass-Lowell’s coach, believed this would be the right time for that reunion to take place. “It’s very good for our guys to see someone who’s not only been able to play at the next level, but who’s been able to graduate from here and who is an alum,” Bazin said. “I think it didn’t hurt his career. It helped it. He was able to mature and take that extra time. 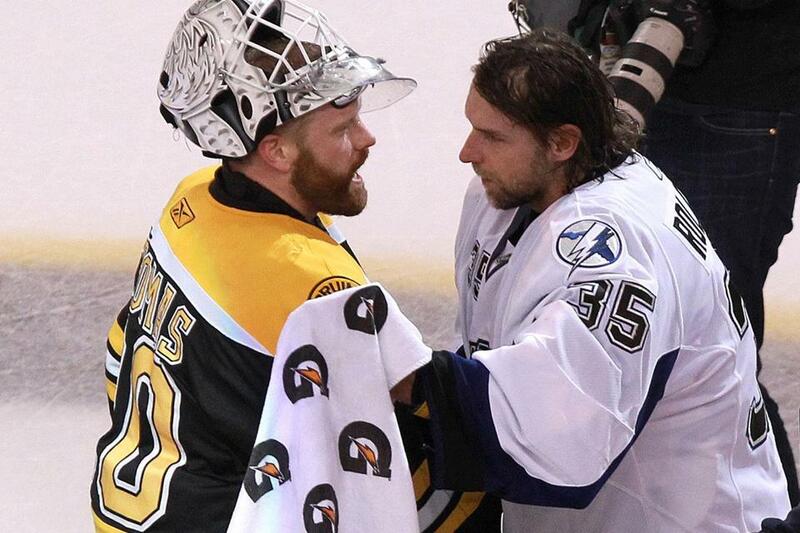 “Right after we graduated, Tim Thomas graduated from Vermont. He took some time to go to Europe to further develop, further mature. Both of them had longer careers than anyone who left early at that time. Roloson was an undrafted 20-year-old freshman when he began his UMass-Lowell career under then-coach Bill Riley. Had UMass-Lowell not given him a chance, Roloson’s 606 NHL appearances (Tampa Bay, Islanders, Edmonton, Minnesota, St. Louis, Buffalo, Calgary) might not have been possible. So as a form of payback, Roloson is making himself available. Last month, he was with the team for road games against Denver and Colorado College. On Thursday, Roloson was one of the first skaters on the ice — no goalie equipment, just a warmup suit — for shooting drills before practice. Assistant coach Cam Ellsworth is the one primarily responsible for working with Lowell’s goalies. Roloson’s role is to serve as another resource. Coaching interests Roloson, although he acknowledges the stress that would accompany the position. But he is not ready to trade his mask for a whistle. Roloson (13-16-3, 3.66 goals-against average, .886 save percentage for Tampa Bay last year) believes he has tread remaining on his tires and has been skating with former Wild teammate Andrew Brunette to stay in shape. If Roloson were younger, he might have signed overseas. During the 2004 lockout, knowing that a stoppage would be lengthy, Roloson joined Lukko Rauma in Finland in October. Now, with sons Brett and Ross requiring dad’s attention, Roloson opted to stay put. Roloson is facing a significant challenge. He is an unrestricted free agent coming off a down year. Anders Lindback and Mathieu Garon are the likely goalie combination in Tampa. Roloson does not want to play in Europe or the AHL. But he has hope. He thinks an NHL job remains within his capabilities. It is the kind of approach his students aim to learn. Each summer, NHLers such as Martin St. Louis, Matt Moulson, and Max Pacioretty turn to Connecticut-based strength and conditioning coach Ben Prentiss to prepare them for another season. Prentiss’s goal is to dial in his clients to peak for fitness testing at the start of training camp. Now, Prentiss’s guys have no target date. The players who remain in North America have most likely seen their fitness levels decline from their offseason sweet spots. During the summer, Prentiss’s clients worked out five times a week, both on and off the ice. They ate neither meat nor gluten. They are now working with Prentiss approximately three times a week. Prentiss uses an undulating program, which adjusts the intensity of the sessions within the week. Monday, for example, could be a high-intensity day. They will back off on Wednesday. On Friday, they’ll perform an in-between workout. The sessions can’t be as intense as the standard offseason workouts because of the uncertainty of the lockout’s conclusion. Prentiss estimated that his clients are 25 percent off their summer fitness levels. Ideally, he could accept a three-week window between the lockout’s end and the start of the season to re-fire his players’ engines. In all likelihood, there will be no such break-in period. On Oct. 17, the NHL released details of its 82-game proposal. It required an agreement to be finalized by Oct. 25, camps to open the following day, and the season to start Nov. 2. In theory, a week of camp should be enough for the players competing overseas to acclimate to NHL pace. That might not be the case for the stay-at-homers. The risk would be strained groins, pulled quadriceps, and aching backs, some of the most likely injuries for players who hit the ground running without proper preparation. In previous camps, the Bruins have divided the out-of-shape players from the main group. “I feel bad for the strength coaches,” Prentiss said of his NHL counterparts. “There’s not much you can do other than hope guys have been working out. You can’t get guys in shape in one week. It’s impossible. If guys haven’t been working out, there’s going to be problems. During the lockout, a person with one of the most challenging tasks is Steve Hatze Petros, the NHL’s senior vice president of scheduling and broadcasting. Hatze Petros, with input from commissioner Gary Bettman, NBC Sports Network, and the 30 teams, is responsible for devising the league’s schedule. Each team regularly updates him with arena schedules, which change during the lockout as events such as concerts, rodeos, and speaking engagements fill in dark dates. Had a CBA been in place for the season to begin Nov. 2, the NHL most likely would have started with the games originally scheduled for that date. For example, the Bruins would have opened Nov. 2 against the Capitals in Washington. Hatze Petros would have had to sprinkle the games originally scheduled for October (the Bruins had nine) into the rest of the schedule. Now, if December games are canceled, Hatze Petros must continue to maintain a fluid schedule in case of an agreement. If a shortened season is possible, the NHL’s priorities are to maintain intraconference play to promote playoff races and give its national broadcast partners (CBC, NBC, TSN, RDS) their preferred games. The Bruins were originally scheduled for 18 games against Western Conference opponents. Those would be reduced or eliminated. Also, because NBC considers Boston a go-to market — Pittsburgh is the biggest American attraction because of Sidney Crosby — the Bruins would be in the mix for NBC slots. One of conditioning coach Ben Prentiss’s current regulars is Colton Orr. The ex-Bruin tough guy has had a rough go lately. After back-to-back 82-game spins with the Rangers and Maple Leafs, Orr was limited to 46 games in 2010-11, mostly because of postconcussion syndrome. Orr appeared in five games for the Leafs last year before being demoted to the AHL. When healthy, the 30-year-old was considered one of the league’s toughest and most honest fighters. Former first-round pick Pascal Leclaire announced his retirement Monday, four days after turning 30. Leclaire, taken eighth overall by Columbus in 2001, cited hip injuries — a common complaint for modern-day goalies — as the reason. Leclaire appeared in 173 NHL games with Columbus and Ottawa. The Blue Jackets traded him to the Senators on March 4, 2009, in a package that returned Antoine Vermette. Less than three years later, Columbus wheeled Vermette to Phoenix, with Curtis McElhinney coming back in return. In McElhinney, the Blue Jackets might have found the reliable goalie they never had in Leclaire. Through 10 games for Springfield, Columbus’s AHL affiliate, the 29-year-old McElhinney had an 8-1-1 record with a 1.29 goals-against average and .955 save percentage, the best marks in the league. Looks as though the Springfield Falcons made the right move in promoting two-year assistant coach Brad Larsen to the top job. Larsen’s Falcons have featured airtight goaltending, solid defense, and balanced offense. Larsen’s stay in Springfield might not be too long if the Falcons continue to win. Like many successful coaches, the ex-NHLer was a grinder during his playing days in Colorado and Atlanta . . . The Boston Blades of the Canadian Women’s Hockey League will face off against players from the Russian national team this month. The first game will take place Nov. 27 at Somerville’s Veterans Memorial Rink. A day later, the teams will have a rematch at Lawrence Academy. For more information, visit boston.cwhl.ca/view/cwhlbostonblades . . . The World Junior Championships are just over a month away. This year’s tournament will take place in Ufa, Russia, starting Dec. 26. The Bruins could send six players: Dougie Hamilton, Malcolm Subban, Seth Griffith, Anthony Camara, Matt Grzelcyk, and Alexander Khokhlachev . . . The young people tell me that two of 2012’s smash hits are “We Are Never Ever Getting Back Together” and “Call Me Maybe.” Curious to know whether Taylor Swift and Carly Rae Jepsen ever believed they would provide the NHL lockout’s soundtrack.